Your new glamour armour of heroic hues and courageous contrasts: eclectically expressive cross-cultural colour. 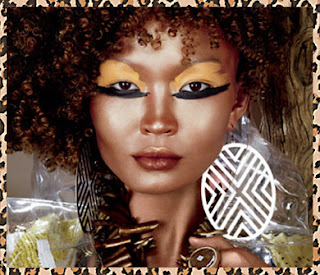 Everything from Lipglass to Beauty Powder Blush exotically packaged to liberate the animal spirit of Woman, Wild Things and Style Warriors everywhere. I’m not going to lie, when I first saw the promo pictures for this collection on peoples blogs I took an instant dislike to it and I promised myself I wouldn’t give in. What do you know, I broke that promise and gave in. I really didn’t understand the big deal with it at first. The gold packaging was horrible along with the animal print (I’m all for a bit of zebra print … usually!) along with the ridiculous silver print. The packaging itself completely put me off so I didn’t take much notice of the actual colours. I finally came round and decided to try some of it though. 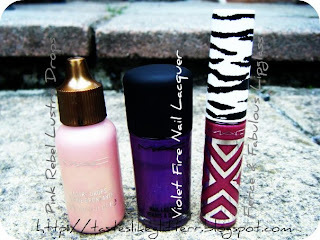 Then I saw Violet Fire Nail Lacquer and was like I must get that! This to me, is the perfect purple. I was a little gutted it came in a black box though. I’ve really been liking purples recently, which shows in my last blog. This is supposed to be a cream?! Well that’s what it says on the label but it’s clearly a frost as it has shimmer to it. And not loads, which I like. 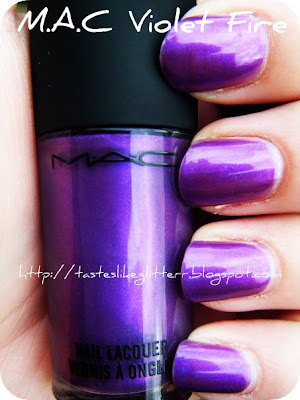 I know there is this whole love/hate thing over M.A.C Nail Lacquers. I must admit sometimes the formula is just a complete pain. The only others I have are Nightfall, which I have no problem with since it’s so dark. And Hello Kitty - Something About Pink which can sometimes look a little streaky. I’m really considering buying a back up of Violet Fire though because it’s definitely one of my new favourites and I love it. 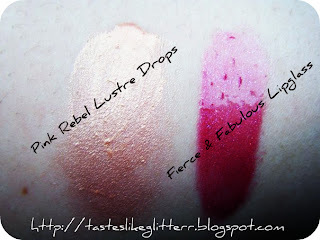 Being so white (NW15) I decided my best bet would be to skip the bronzers and the other Lustre Drops as they’re more bronze then Pink Rebel. Which suits me perfectly. This is a great highlighter as well as a bronzer. I like to apply a little of this over Well Dressed blush to give it a bit more shimmer for that Summery look. As I said, I’ve really been liking purple at the moment, especially purple lips. Funtabulous DazzleGlass = Love! It took me a while to decided whether I really wanted this. And of course I did. What’s more it had the zebra print cap! I would love this more if it didn’t have the horrid silver print but what can you do?! I was slightly disappointed when I first saw this because it looks a lot more pink-er in the tube then on the swatch from the website. I have since grown to love this. It’s quite a deep colour with a slight shimmer and at the moment I can’t stop using it. Overall I didn’t love this collection. Hence the lack of purchases. But what I did get from it I really love.